Got to be a prank. 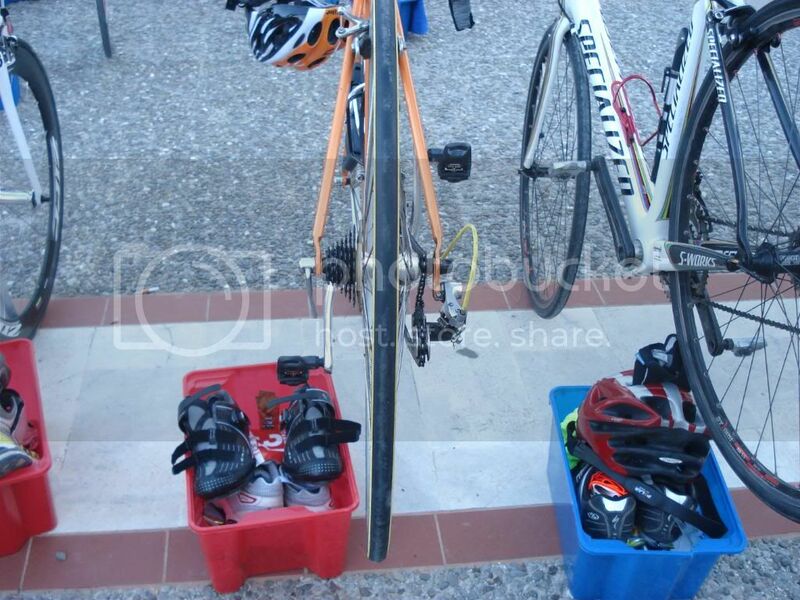 I suppose it's a triathong transition zone, don't they clip their shoes in in advance any more and insert their feet on the move ? Actually might make more sense than you think, though I believe MrN's solution may be better. If I'm putting my shoes on without sitting down, I will cross my leg over the other knee, so the right leg is on the left side to put the shoe on, and the left leg will be on the right to put that shoe on. Not always. I tried that last season and had Hilarious Results (the best: kicking a shoe clean over the road). It's tricky, takes practice - but yes, the fast folk do that. Psst, Clarion... it's not the shoes. Oh heck, that's going to slow them down a bit, ain't it? Oops ! I bet someone gets shouted at. Got to be a prank. it's a genius idea for next ride with little brother, when he nips behind a hedge for a wee..
Best bike-related prank I ever saw was take a crank off and replace it 90 deg out. The victim jumped on his bike, clipped in, then stumbled as he tried to clip in the other side. The genius bit is you can see the pedal is vaguely in the right place but your brain doesn't instantly process it as wrong - it's still on the correct side, it still rotates... Took him 4-5 minutes of staring at his bike to finally work out what we'd done. That's a good one. Another famous prank was to fill the seat tube with lead shot. Fill the tubes (tyres, natch) with water. It gives quite an odd ride! Can someone please explain this to the resident slow learner? Fanks. Look at the chain, and then look at the cassette! Yes. It's hard to see how you could do that by accident. But it's really mean to do that to someone in a race isn't it? That's beyond having a laugh. I've never seen that sort of meanness at a triathlon - it's really friendly; the closest to snark are the focused introverts. Much more likely is that someone transported their race bike inside their car, and got their non-racing cohort to put the wheels on. Much more likely is that someone transported their race bike inside their car, and got their non-racing cohort to put the wheels on. but it's not just accidentally putting the wheel in the wrong way -- they'd have had to reverse the skewer while they were doing it as well..
... unless the non-biking runner/swimmer already had the skewer the "wrong" way round, I guess.